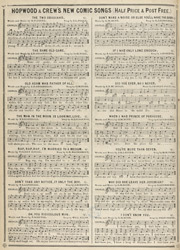 Male music hall performers produced songs that acknowledged the growth in confidence and visibility of women in society. G W Hunt composed a number of songs during the 1870's concerning sophisticated and fashionable young men who were tricked by predatory women. This music sheet illustration shows a woman in argument with a cab driver whose fair she cannot afford, the chivalrous gentleman, in this case played by George Leybourne, pays for the woman's cab fair as well as lending her money with which to purchase a dress. He discovers afterwards that it was a swindle and the woman escapes with his money.